Your favorite child will grow their faith with this gift of God's word. 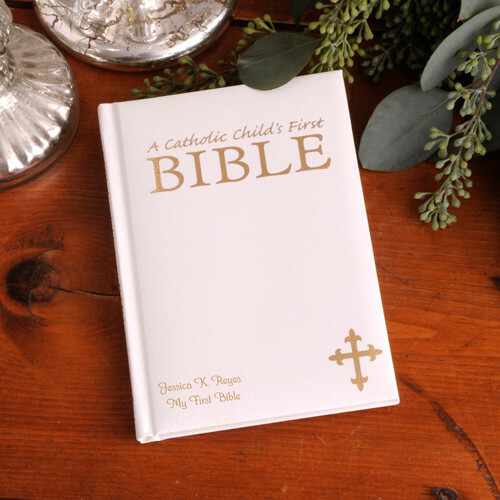 Our illustrated Personalized Catholic Child's First Bible makes a wonderful addition to any child's book collection. Personalize with two lines of up to 30 characters per line. White Cover. Kid-friendly, the book offers simple Old and New Testament stories designed for the young- or non-reader. A lovely gift that a child will treasure for years to come! 96 gilded pages. Measures 4 1/2" x 6" and includes gift box personalize with two lines of up to 30 characters per line.